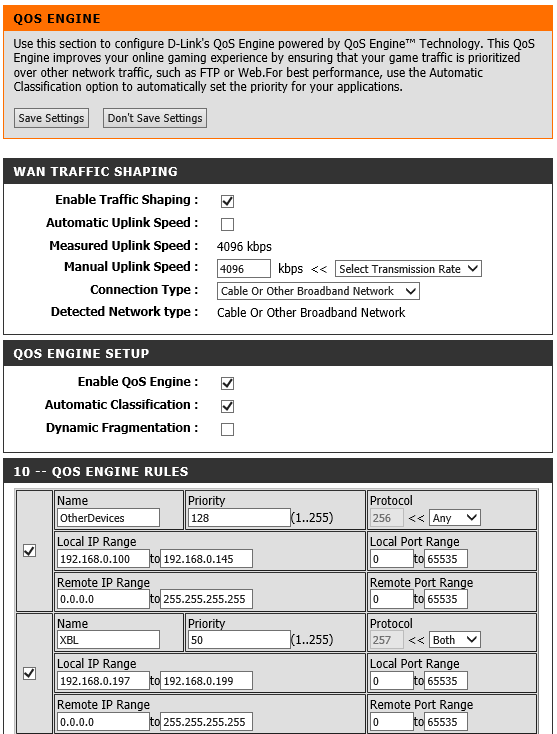 The following settings need to be setup for DGL or DIR Series routers. QoS is enabled however not fully configured. Gamefuel is disabled by default on DGL series routers. Enable Traffic Shaping(DIR Series only): Should be enabled by default. Enable GameFuel or QoS: Should be enabled by default. DIR Series Routers: Use 65.52.0.1 - 65.55.255.2554 for Remote IP Address Range. I have tested these settings on a DGL-4500, DIR-825, DIR-655, DIR-827, DIR-857, DIR-826L, DIR-865L and a DIR-657 and gaming works very well over a 10Mb/1Mb and 50mb/2Mb cable Internet service connections using a Motorola SB 6120, SB 6121 and SB6180 cable modems. Others are using these settings as well. These settings help to ensure that your networking system is running optimal as much as possible. The above settings work for multiple game consoles online at the same time. NOTE: Game lag has been seen and experienced and can be attributed to other XBL users and there network configuration conditions, XBL gaming services conditions or ISP service conditions. It's not guaranteed that these settings can or will resolved any networking problems seen by users. These are proven useful and work great. Please refer to LookIntoMyEyes stick for the PS game console in the FAQ Library for that platform. If anyone uses theses and has the settings please post or send me the information and I can post them along with these settings. Any suggestions, corrections or improvements to this, please post or email me. Feel free to post your findings and experiences.